Last week, we hosted 60 IT influencers in Copenhagen for the Dell EMEA Innovation Day. We brought to life the innovation theme alongside the biggest trends impacting the industry today – cloud, big data, security, mobility, convergence and IoT. Our subject matter experts and customers brought these trends to life by sharing their experiences and thoughts on how technology innovation is shaping their businesses and impacting their customers. We kicked-off with a welcome dinner in the beautiful settings of Copenhagen’s Tivoli Gardens, one of the oldest theme parks in the world. Guest speaker Dr. Christian Busch, director at the London School of Economics’ (LSE) Innovation and Co-Creation Lab, inspired our audience with his insight on how businesses and people can better harness innovation to make impactful change, setting the scene for the main event. "Innovation means everything to me and my business at Cambridge. 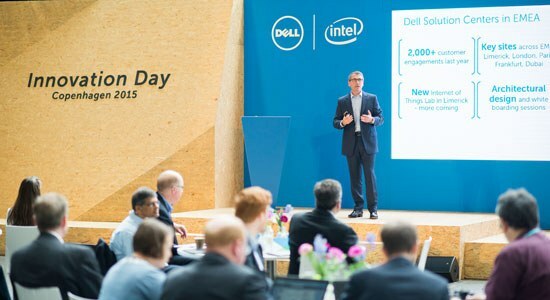 The Dell Innovation Day has been very useful for me to meet with Dell executives and to understand Dell’s direction," says Paul Calleja, HPCS Director at the University of Cambridge. Below you find a short video that captures the day. I was very much inspired by all of the discussions and valuable feedback we got from attendees, which we will take on board as we continue to innovate for the benefit of our customers and partners.